Squirrels can be a pest in your yard. They feed on birdseed, flowers, plants, pet food and garbage. 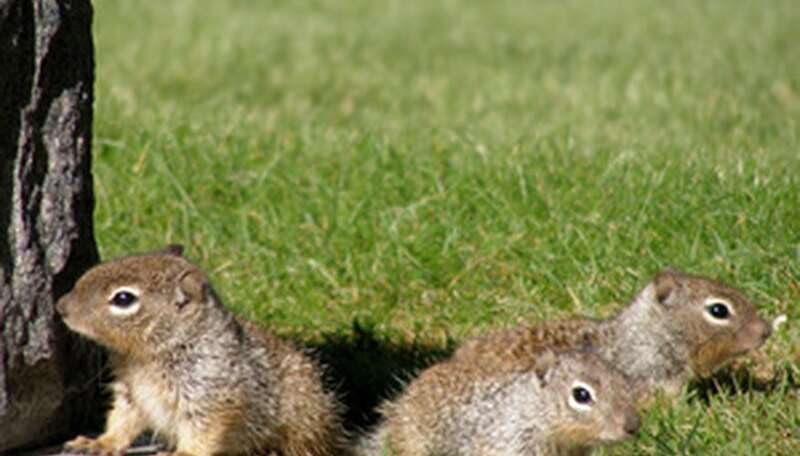 To keep your yard safe, you can create homemade squirrel repellents for the yard. You can use a three-prong method to keep squirrels from entering your yard from the ground and above. These three methods must be used on a consistent basis to keep squirrels out of the yard. Dig a border around the yard with the shovel. Create a border along walkways and shrubs. Plant an assortment of nasturtiums and alliums. Squirrels avoid these flowers because of their odor and taste. Place mulch or compost around the flowerbeds. Water the soil to keep the ground moist. Both nasturtiums and alliums are self-seeding perennials that return each year. Plant marigolds around trees, birdfeeders and fountains. This will keep squirrels from climbing up to feed and water. Crush up a strong-scented soap into a powder. Place the powder into mesh bags such as those used for clams. Tie the bags with twine at the top of the bags. Tie the bags to tree branches and fence posts. Set the gallon jug on the kitchen counter. Pour the hot sauce into the jug of water. Add the dish soap to the water. Put the cap on the jug and shake the jug well. Take the top off of the spray bottle. Put the funnel into the spray bottle opening. Carefully pour the mixture from the jug into the spray bottle until the bottle is full. Remove the funnel and put the cap back on the jug. Put the spray attachment back on the spray bottle. Mist the plants around the yard with the mixture. Use a liberal amount along the perimeter of the yard, bushes and flowerbeds.